What Is in the Middle of Saturn? Which Planet Has the Strongest Pull? One of Sir Isaac Newton's accomplishments established that the gravitational force between two bodies is proportional to their masses. All other things being equal, the planet with the strongest pull is the one with the largest mass, which is Jupiter. It is so massive and has such a strong gravitational pull, it likely prevented the formation of a planet between itself and Mars in the region known as the asteroid belt. 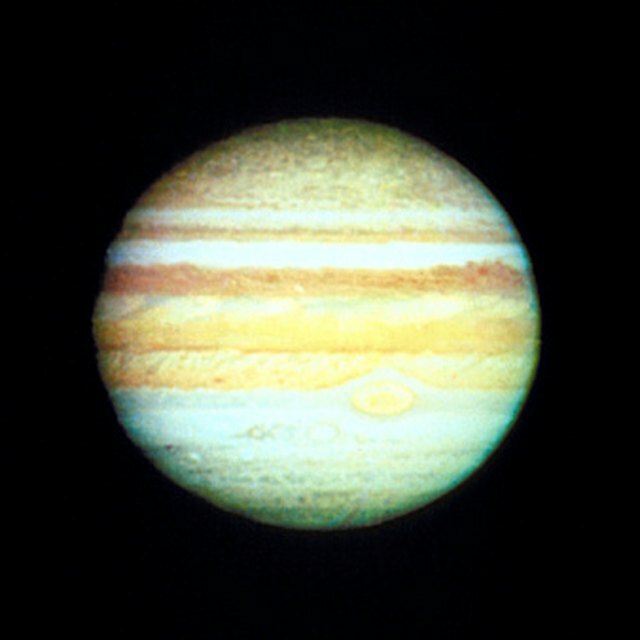 Jupiter, the fifth planet from the Sun, has the strongest gravitational pull because it's the biggest and most massive. Jupiter is by far the largest planet in the solar system -- all the rest of the planets, put together, would easily fit inside it. It has a mass of 1.898 octillion kilograms (4.184 octillion pounds) -- more than 317 times that of the Earth. Jupiter is a gaseous planet and doesn't have a fixed surface, but if you could stand at a point in its atmosphere at which the atmospheric pressure is the same as on Earth's surface, your weight would be 2.4 times what it is on Earth. In the late 1700s, a pair of German astronomers discovered a mathematical formula that allowed them to predict the distances of the planets from the sun with surprising accuracy. This relationship, known as the Titius-Bode Rule, is reliable enough to have contributed to the discovery of Uranus, although it fails to correctly predict the orbits of Neptune or Pluto. It is accurate as far as the first seven planets are concerned, however, and it predicts the existence of a planet in the region occupied by the asteroid belt. The intense gravity of Jupiter is the probable reason why no such planet exists. Jupiter is almost big enough to be a star, but it would have needed to be approximately 80 times more massive when it formed for its gravitational field to be strong enough to initiate hydrogen fusion at its core. As it is, it has attracted 50 moons large enough to have names and 18 smaller ones. Some of these moons were probably formed at the same time that the planet formed, but others may be captured comets and asteroids that have wandered into the solar system from interstellar space. Some, like comet Shoemaker-Levy 9, eventually orbit within Jupiter's Roche limit -- the closest a body can approach a planet without being pulled apart by the planet's gravity -- where they break apart and fall to the planet's surface. Jupiter's gravitation attraction has profound effects on the rest of the planets in the solar system. It protects the inner planets from asteroid impacts by attracting asteroids and altering their trajectories. It also causes Mars to orbit in a path around the sun that's more oval and less of a perfect circle than most other planets, which has an effect on its seasons. The gravitational pull of Jupiter also perturbs Mercury's orbit, which is already highly eccentric, and it may lead to the destruction of that planet, according to astrophysicists Jacques Laskar and Gregory Laughlin. Their computer simulations predict that Mercury could crash into the sun, Venus or Earth, or be ejected from the solar system, in about 5 to 7 billion years. What Is Mercury's Rotation Period? What Is the Average Temperature of Jupiter? Deziel, Chris. "Which Planet Has the Strongest Pull?" Sciencing, https://sciencing.com/planet-strongest-pull-23583.html. 19 April 2018.